All modules can be activated or deactivated at compile time, and are highly configurable at run time. Where it makes sense, it is possible to include only selected folders in the module. The notification is executed after filtering, so it is possible to exclude spam or other unwanted messages. A system tray icon. The tray icon can optionally announce new incoming mail by displaying a passive popup following the desktop notification specification, so the appearance of the popup is themeable and blends in nicely with other applications. The screenshot shows the standard theme. 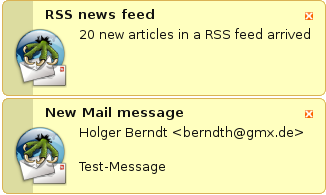 Two toaster popups that notify about new articles in an RSS feed (needs the RSSyl plugin) and a mail message arriving at the same time. The popup module also optionally offers support for the desktop notification specification. The screenshot shows the ubuntu theme. The Banner module will fill your screen width with a horizontally scrolling ticker. 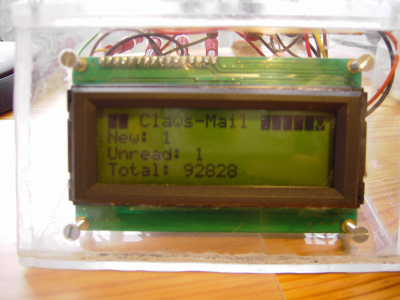 The LCD module can display your mail status on an LCD. It uses the LCDproc daemon for that, so all LCDs that are supported by the LCDproc project are supported by this plugin. Please excuse the crappy picture, my camera wasn't able to do better.